If you've ever driven past Tam's (and, chances are, if you live on the South Side, you have), you probably thought it was for sale. Maybe even abandoned for at least a few years. The building's paint is faded in places, peeling in others, the neon signs hang precariously, and the lot has, in the summer months, weeds spewing forth from every imaginable crack. 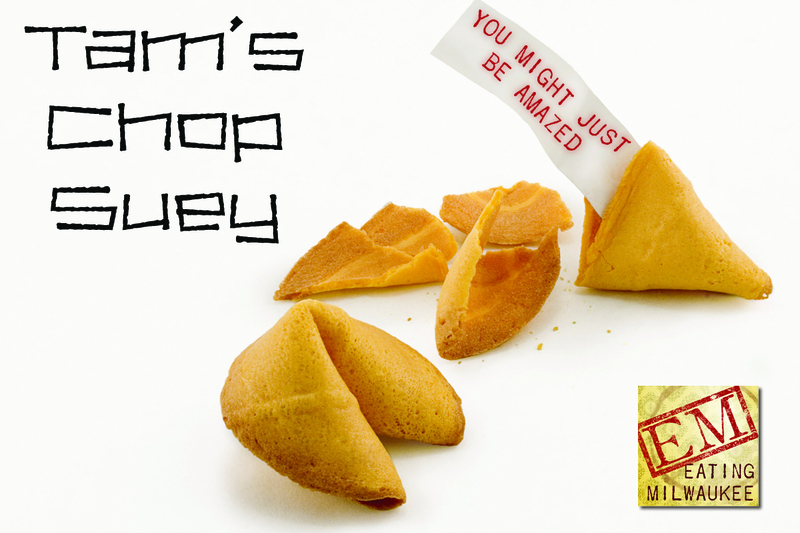 No, Tam's Chop Suey doesn't look like much. But that's okay. 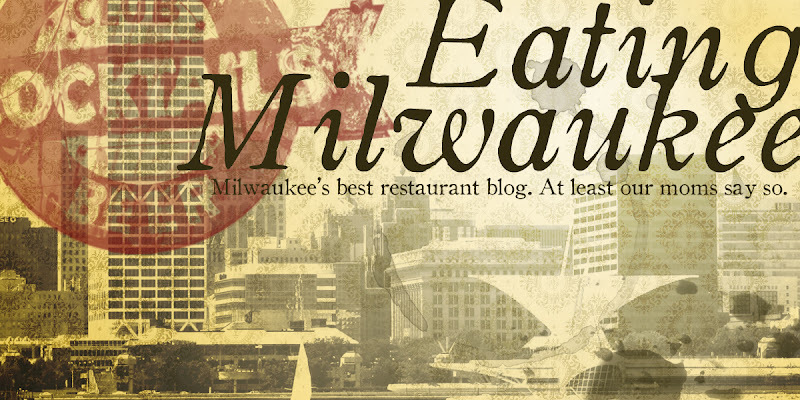 Because if you've learned anything from Eating Milwaukee, dear reader, it's that looks can be deceiving. 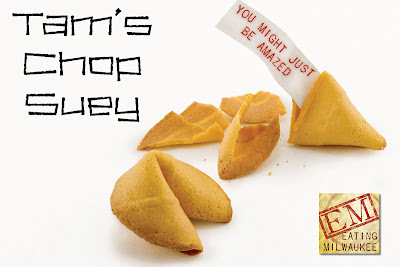 First, let's get something straight: Tam's is not a gourmet Chinese restaurant. Don't expect any baroque ingredients, any preparations with XO sauce, or intricately carved radishes shaped like roses. Tam's is an old-school Chinese restaurant, the sort of place your grandparents would go to when they felt like eating something really exotic. Like shrimp egg foo young. Tam's interior is simple. Walk in, and you're immediately at a take-out counter, complete with a large, mostly impertinent visual directory of some of the items on the menu. Behind the counter, a tiny Chinese sparkplug paces back and forth, waiting for her favorite customers to come in and pick up their take out. Open the door on any given evening, and you'll hear her distinct shout, "Helllloooooo!" with the tone and cadence of greeting a long lost friend. ﻿Tam's does a very brisk take-out business. In fact, you'll see more folks sitting on the benches by the counter waiting for their take-out order than you'll see sitting in the dining room. I'll be the first to admit, I usually order take-out from Tam's, too. They offer a huge assortment of lunch specials, and due to their proximity to my workplace, my co-workers and I have been known to order lunch two, three, or even four times a week. But this is about the dinners, dear readers, and I thought, for a change, we should dine in. So, on a cold and blustery December evening, we took the trip to Milwaukee's most haunted looking Chinese joint. Inside, Tam's is a blast from the past. You can tell, in decades past, couples would pull up in monstrous Detroit Landyachts with Opera Lights lit, step out onto a weed-free parking lot, and tuck into a night on the town, starting with some of that mystical and wonderfully foreign "Oriental" food. Now, things are a little on the run-down side. I'll forgive that, providing that the kitchen stays clean and the food stays tasty. The dining room is nothing to write home about, dimly lit and with a few typical Chinese décor touches. The bathrooms, well, er, just go before you go out to dinner. And tell Timmy to sip his soda. Slamming Pepsi after Pepsi is only going to get him a very uncomfortable ride home. And we all remember how that ended last time. The menu is lush, but easy to navigate. True to the old-school Chinese restaurant roots, Tam's menu is divided by meats, with sections for poultry, beef, seafood, and vegetarian choices. The owners are happy to accommodate, and will gladly cook off-menu for you, if they have the ingredients, and will add/subtract anything to suit tastes. We started out with the usual appetizers for a traditional old-school Chinese feast. I think everyone I know adores Tam's egg rolls. Filled with a flavorful balance of cabbage and meat, with the wrappers at the perfect nexus of crispy and chewy, Tam's doesn't try anything avant-garde here. These are the egg rolls that I remember from the long-gone dining rooms of China Town and Peach Garden (okay, I know these places are still in business, but nothing like they used to be...). Egg rolls seem to be a barometer for Chinese/American restaurants these days: bite into one and find crunchy, uncooked cabbage and red-dyed "meat," your meal will probably leave you disappointed. Luckily, Tam's egg rolls are fantastic, and doused in their bizarre thin, watery hot mustard, and they're sublime. I have strong feelings about deep-fried dumplings. It's kind of like deep-fried Oreos or deep-fried carrots... just things that have no business being crispy. But, Tam's makes it work. The dumplings are filled with a tasty meat mixture, and the size of the dumplings makes them manageable, but still in danger of becoming mouth-shrapnel. My advice: if you like dumplings the way I like dumplings, order them steamed. You'll be happier. The Cantonese fried shrimp are HUGE. Freakin' gargantuan. Served with a nuclear-orange sweet and sour sauce, they're tasty, but a bit on the greasy side. Maybe I'd be more excited about them with a different dipping sauce. Maybe chili sauce? Andy, in keeping with EM tradition, ordered his General Tso's chicken a fiery hot. Despite this, the sauce was pleasantly sweet and sour, rich and flavorful, without being overly sugary or vinegar-y, which can be a downfall of most chain-like Chinese. Lauren's Chicken with Three Mushrooms (not three physical mushrooms, but three kinds of mushrooms) was outstanding. I might go so far as to say it was the star dish of the evening. The chicken was tender but never jelly-like, the mushrooms (and I'm not entirely sure the varieties used) were fresh and flavorful, but the sauce... oh, the sauce! Deep, rich, and mushroom-y, salty, a little sweet, full of mouth-watering umami and the occasional crunch of fresh green onion. I would, despite not being the mushroom-fiend that Lauren is, order this again in a heartbeat. My Hot Braised Chicken was a nice change of pace. Battered and fried chunks of chicken in a sweet and sour sauce which, strangely enough, tasted nothing like the General Tso's sauce. A little tangy, nice and sweet, with some red chili punch, not at all flavored like ketchup or duck sauce. Sliced water chestnuts, carrots and bamboo shoots rounded out the Necessary Veggie Quotient. A Hmong friend at work had ordered Hot Braised Pork at work in the past, and gave it a passing grade, so I figured the chicken wouldn't be far behind, and in that, I was mostly right. I think my biggest misgiving about my entrée was that the chicken was battered and fried. I'm not entirely sure where the whole "braised" part comes in, since it would appear that, save the garlic in the sauce, nothing in the dish endured a braise. Pair the battered chicken bits with a hot sauce, and suddenly the batter is slipping off faster than a soccer mom's blazer at a Justin Bieber concert. Just savor that image for a while. Lost your appetite yet? Well, that's too bad, I guess I'll just have to eat your portion of Triple Lobster Sauce. Pictured here, with our old nemesis, Egg Roll, Photo Bombing the poor thing. I really like Tam's Triple Lobster Sauce. I actually kind of love it. Oh, who am I kidding? I'm addicted to the stuff. I'll order it weekly for dinner, to be sure, and every time I call, the owner knows it's me, and chuckles to herself as I order the exact same thing. But this is fantastic. Better than fantastic. This is a rare breed: a cross of actually authentic Chinese cooking and saucemaking with the American need for More. Lobster Sauce has no lobster in it, but rather it was served with lobster. While there may be a lobster in every pot in China, we're not quite so fortunate here in snowy Wisconsin, so the more typical American preparation is shimp in lobster sauce. Lobster sauce is a harmony of strong, potent flavors: black fermented soybeans, garlic, pork, wine, egg, and green onion. Sure, it sounds like a nightmare. Actually, it sort of looks like one, too. But the flavor is immense and unmistakable. Dark, murky, rich, and chock full of funky rotten bean and garlic flavor. You have to be a fan of the ferment to get down with this one, but close your eyes and tell yourself it's just soy sauce you taste... you'll be in Lobster Sauce Oblivion and you'll never know those beans started life lily-white. Tam's lobster sauce is dead-on, probably one of the better ones I've tasted in the city (excepting my own, of course). The liquid has the right mouth feel, thick and unctuous with a little bit of fat supplied by the ground pork. The black beans give their all, making a flavor that is completely unique but instantly recognizable, even by someone who has never had the dish before. Of course, you can get just shrimp in your lobster sauce. But Triple Lobster Sauce makes things a little more interesting, adding chicken and beef to the mix. The shrimp are on the, well, shrimpy side, both in size and flavor, with a little more iodine than I'm fond of, but I gladly put up with it for the rest of the dish. Chicken and beef fall in line, with the chicken being tender and the beef being a bit more chewing, giving you all sorts of awesome textural contrast in each bite. Please, do me a favor, though... don't put any soy sauce on any of Tam's food. The owners season everything perfectly, and add soy (which, oddly, was Kikkoman, which is a Japanese product...) and you've got a veritable salt-lick on your plate. No, nothing we ordered really needed any seasoning at all. 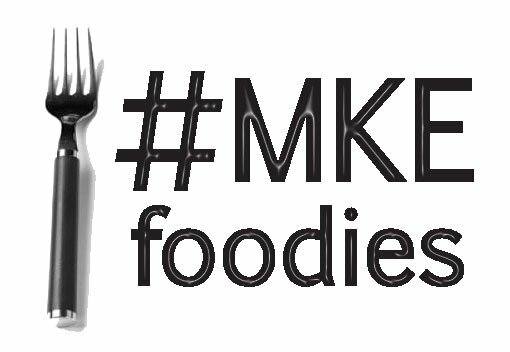 I know there are faster, cheaper, and more authentic Chinese restaurants in Milwaukee. I know this. But Tam's is a pleasant throwback, a nostalgic gastronomic time capsule, a way to re-connect with some of the food that made me love food in the first place. I can remember the smells as the server at Peach Garden would, with a little bit of theatre, lift the cover off the stainless steel serving dish of my Hong Sue chicken, watch as platters of noodles and mu shu pancakes came out of the kitchen. On another day, my dad and I would walk to the Washington Park Lagoon, maybe fish for a while, and Asian families would gather on the shores with camp stoves and woks, cooking their catch only minutes after cleaning them, and those same luscious smells would waft over. Portion sizes are absolute huge. Food quality is good. And if you'd like, when you order carry out, you can get a "single" portion, which is enough for a large lunch or comfortable dinner with no leftovers. Most "single" portions are in the $6-8 range. The service in the dining room was fantastic, but carry-out is equally wonderful. I always tip when I do carry out, and the owner always blushes, thanks me, then scolds me for tipping. Everyone is always pleasant, smiling, and ready to talk your ear off. I don't think I've ever seen her frown. Tam's doesn't break any new Chinese/American food ground. But it is damn tasty, and brings back a lot of memories for me. For a step above the New Super A-Number-1 China Wall restaurants that are popping up faster than Walgreens', this is a nice option. We LOVE Tam's and would not eat any where else. My Mother comes from 4 hours North of Milwaukee and will get enough Tam's Egg Foo Young to take home with her, besides our take out twice a week during her stay to have while she is here. The owner's are friendly, helpful, and the food is the BEST! We were there today for lunch and had sweet and sour chicken with chicken fried rice. It was awesome. Will be ordering sweet sour shrimp next time, as I love shrimp. Food Great. Again one family in when we came and they were done eating. Relaxing. Owners are quite accommodating. Please listen to the blog above and go. Well worth it. I know I will be going back. PLUS, this was our first time there. We read the blog above and decided to go. PLEASE GO. oh my goodness i went to that restaurant today their food was amazing so good that i had to take some food home and share with all my family members they loved the food also, the fried rice was unbelievable delicious the hot braise chicken was one the best dishes i have ever had in my life. Tams is the best food in Wisconsin. I just went to tams last night which was 1/22/12 and I had the best service and also saw on the wall tams was a five star restaurant in 1990 but its exterior needs a makeover but still the food is the best food I have had in my life. Tam's has closed... Thank you to the families that operated the place for the last 30+ years. I remember when Mr. Tam first opened in the old Der Wiener Schnitzel building on 76th, near the Taco Bell. Although there were always language challenges, it didn't stop him from engaging his customers. He remembered, and always appreciated his customers. I really enjoyed the food and will miss the quality of ingredients that were used, I.E., chicken was full white muscle meat vs. the often gristly random chopped pieces at other Chinese places. If anyone has suggestions for comparable places, please post.